Lord British has kept busy over the past few years. 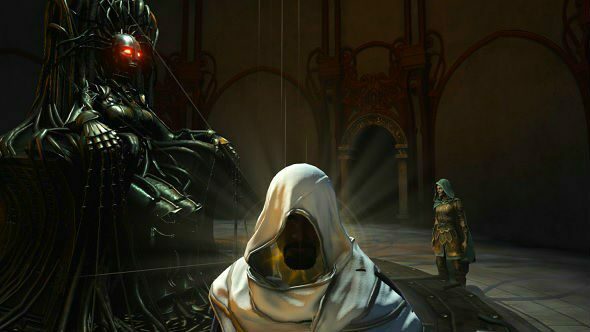 Known formally as Richard Garriott, the legendary designer of Ultima and part-time astronaut has been working on Shroud of the Avatar, the successor to his classic RPG series. The game is due to arrive on PC on March 27th, which is soon, and so Garriott has plenty to say as he shows us around his latest ambitious project. What will be your next adventure? 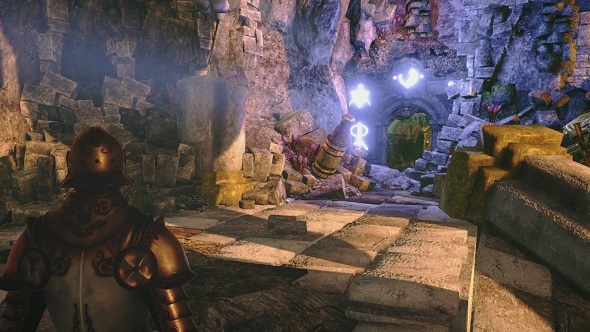 Check out the best RPGs on PC. 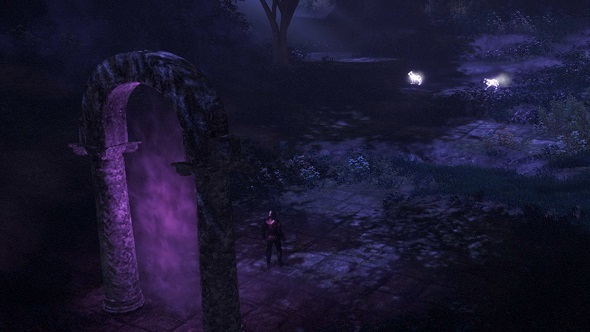 Shroud of the Avatar has some modern tricks to flaunt but it is firmly rooted in classic RPG design. It sits somewhere between a single-player campaign and an MMO experience – what Garriott calls “selective multiplayer.” There is a traditional hero’s journey that you will be able to go through alone or with a party of mates. Notably, it is co-written by author Tracy Hickman of Dragonlance (and, fittingly, the Shroud of the Avatar tie-in novel) fame. This collaboration is key to Shroud’s existence as Hickman’s input on the fantasy started before any work on the game did. But this is not an entirely authored experience as the story is at the whim of a virtual world and economy driven by players. And it is up to each of them to decide how much they want to engage in it with their fellow adventurers. My play session begins with a brief tour of New Britannia – Garriott excitedly shows off many of Shroud’s overworld systems. Constellations shine in the night sky to direct players below to where evil might be found. Cities burst into flames as hordes lay siege, and quiet player-run hamlets buzz with light when inhabited. It is all rather complex and overwhelming at first. This is a world that has clearly been inhabited by thousands of players for many months now. In between those constellations, the skies are being torn apart by shooting stars. An event has been running for the past three months and is set to culminate with a grand collision at launch. 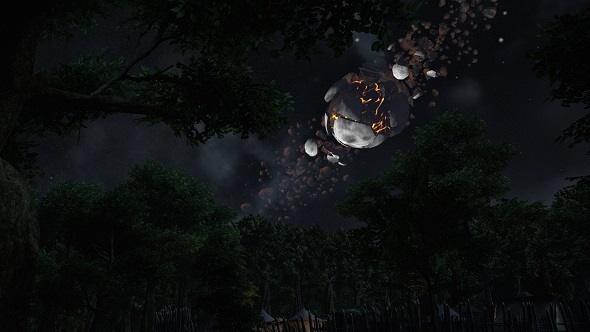 Garriott gives me a glimpse of the carnage set to unfold on March 27th (spoilers follow, of course): a huge rock has torn through a mountainside in one of New Britannia’s many adventuring zones, the impact revealing a new dungeon from which a new form of magic seeps into the world. We finish on an airship that flies above one of Shroud of the Avatar’s many towns. The idea these settlements represent, of giving players a home, runs throughout the Ultima series. “Having property gives you a stake in the reality,” Garriott explains as he looks down on a hodge-podge collection of cottages and gardens. With the exhaustive depth he describes – houses can be outfitted with traps, buried treasure, and monsters to turn them into more of a dungeon than a home – it is clear the team is relying on players to build out their own adventures with (and against) each other. At 56, Garriott has been making games for some time now. “I’ve been the oldest forever,” he jokes when I comment that Ultima was a little before my time. Garriott feels he has only grown more confident as a creator with age: he has no problem with a “kitchen-sink” approach to throwing everything out so that, like Ultima 4, Shroud of the Avatar represents a storytelling and technical reset for him. There is a clear excitement in his words when talking about the selective multiplayer elements of the game. And as far as telling an ostensibly traditional fantasy story in 2018, Garriott promises “to push players out of their comfort zones” with themes and scenarios. He will need to. Shroud of the Avatar’s long development in Kickstarter, then Early Access, has left many underwhelmed. The game currently sits with mixed reviews on Steam with the more negative ones citing a grind that is stuck in the past as the reason for their discontent. But Garriott is confident in where Shroud of the Avatar stands less than three weeks from launch. Come the end of this month, we will see if a wider audience will share the same fondness Lord British holds for his newest, sprawling endeavour.